Overview - Tod Shaw, a small-town cop, is a former Marine who lost his best friend in battle. Now unable to deal with the label war hero, he turns to alcoholism, which costs him his job. But after news hits that the President is coming through their town of Suddenly, he's allowed to remain on duty- and it couldn't come at a better time. Three assassins posing as Secret Service Agents have not only taken over his late friends' home, but has also taken his family hostage and it will be up to Shaw to come to grip with his demons and save not only them, but the President of the United States. When I first popped 'Suddenly' into my Blu-ray player I really didn't know what I was getting myself into. I simply assumed that it was just going to be another mediocre DTV thriller starring Ray Liotta. And then, as the main titles hit the screen, something truly magical happened -- Uwe Boll's name appeared before my eyes. Yes, somehow I went into watching this flick without realizing that it was directed by one of contemporary cinema's most infamous "auteurs," and with his latest effort, he turns in a truly "special" work of art. A thoroughly terrible excuse for moviemaking, the film is utterly generic, empty, and exceedingly amateur. And while it might be worth a few unintentional laughs here and there, Boll's approach to the material is so lifeless and dull that this is really a title that will only appeal to masochistic viewers (you know who you are). Based on the original 1954 film of the same name starring Frank Sinatra (which I have not seen), the movie follows a small mountain town deputy, Todd (Ray Liotta), who uncovers a conspiracy to murder the President. When the assassins set up shop in his city, Todd attempts to thwart their plans, but the situation becomes dire when the deputy's friends are held hostage. Out to save his loved ones and the Commander in Chief, the lawman must race against time to prevent a national crisis. I've seen many boring movies over the years, but I don't think I've ever checked the timecode while watching a film quite this often. To be honest, after about five minutes, I just wanted the thing to end, and soon started to have flashbacks to long road trips with my family as a kid, when I constantly asked, "Are we there yet?" over and over again. Sadly, I was constantly greeted with the wrong answer. To clarify, it's not that the movie is actually unwatchable, it's just that it's mind-numbingly tedious, and Boll's pedestrian attempts at drama all fall completely flat. The ingredients for a decent thriller are certainly present in the premise (and by most accounts the original film is very solid), but the execution here is distressingly basic and nearly comatose. In a bizarre feat of incompetent filmmaking, Boll manages to create a movie full of tense situations that somehow end up carrying no tension. Seriously, most of the script is dedicated to a contained hostage situation in a house with assassins and an innocent family, and none of it amounts to a single shred of excitement. I'm still not exactly sure how he pulled it off, but if the film wasn't so hackneyed, this achievement would be genuinely impressive. Even worse, the runtime is lathered in a 90s TV aesthetic that's completely devoid of any semblance of style. The point and shoot approach looks cheap and the movie features clunky editing and a horrible hand holding score. The tone is very hokey as well (likely making the film seem even more old fashioned than its 50s inspiration), with a cartoonish sense of humor that is totally at odds with the subject matter. This leads to some awkward and silly performance choices that border on laughable. A requisite troublemaker kid character, Pidge (Cole Coker), and his Grandfather are especially ridiculous, and the duo are the source of some of the film's only entertaining spots. Their idiotic, bumbling antics (the grandfather actually electrocutes himself) are mildly amusing in a "so bad it's good" kind of way, and I for one really wouldn't mind seeing an entire spinoff based on their misadventures. It could be called 'Pidge and Pa.' Hell, with a name like that it basically writes itself. On a more serious note, however, poor Ray Liotta and Dominic Parcell (who plays the main antagonist) actually seem to put in some legitimate effort. Sadly, while their acting is earnest, with their clichéd characterizations and Boll's generic direction they probably would have been better off just phoning it in. Or better yet, just not showing up to set. Believe it or not, 'Suddenly' is actually the very first Uwe Boll film that I've seen, and unfortunately, the director fully lives up to his notorious reputation. From the moment its amateur main titles sequence starts, all the way until its amusingly abrupt ending hits the screen (the damn thing feels unfinished), the film proves to be a perfect example of terrible moviemaking. Far from just another mediocre DTV thriller starring Ray Liotta, this happens to be a horrible DTV thriller starring Ray Liotta that also sports the proud stamp of Uwe Boll. Those especially brave movie fans who enjoy torturing themselves with bad flicks might want to take a look, but most sane, healthy viewers will want to avoid this one. 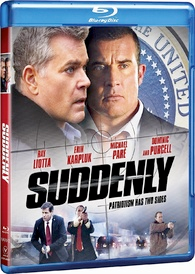 Vivendi Entertainment brings 'Suddenly' to Blu-ray on a single BD-25 disc housed in a keepcase. After some skippable trailers the disc transitions to a standard menu. The packaging indicates that the release is Region A compatible. The film is presented in a 1080p AVC/MPEG-4 transfer in the 1.78:1 aspect ratio. While the cinematography itself is quite underwhelming, the image features a clean, sharp look. The source is nearly pristine but there is some fuzzy noise visible in darker scenes and shadows. Detail is actually very impressive, with distinct fine textures readily apparent. Dimension can also be pleasing, showing off the film's snowy mountain town location, but the movie's mundane lighting can lead to a flat look during indoor scenes. Colors adhere to a natural palette, but saturation is on the dull side. Contrast is high with bright whites (the way the snow pops of the screen is especially striking). Though solid, black levels can look a tad elevated. 'Suddenly' features a very low budget, monotonous aesthetic that lacks much in the way of pop, but the transfer itself is technically strong, offering impeccable clarity and detail. The movie is provided with an English DTS-HD MA 5.1 track along with optional English SDH subtitles. Extremely basic and at times a little annoying, this is a serviceable but unimpressive mix. Speech is clear but dialogue has a comparatively flat and slightly edgy quality in some scenes. The soundstage is a bit front-loaded and effects work is fairly marginal, offering a decent but generic sense of space and atmosphere. The film's overbearing score is the most prominent element of the track, and the overly dramatic and sometimes goofy music cues are actually kind of irritating. Dynamic range is solid and bass activity is passable, but the sound design as a whole is rather pedestrian. The audio gets the job done, but the film's low budget leads to a generic and forgettable mix. While there are no glaring issues, there's little that stands out here. Not surprisingly, we get absolutely no special features, thankfully sparing us the pain of having to listen to the cast and crew pretending to be excited about the flick. 'Suddenly' is the latest installment in Uwe Boll's increasingly asinine filmography. Pedestrian, dull, and just plain stupid, this is simply a terrible flick. Despite a cheap aesthetic, the video transfer is actually impressive. On the other hand, the audio mix is very generic and one-note, but it manages to get the job done. There are no supplements included, but I doubt many viewers will be complaining. Even those who usually like to laugh at terrible films will likely find little amusement here. Unless you happen to be a particularly brave filmgoer open to painfully boring and head-scratching viewing experiences, this is one to avoid.